Radial-shaft-seals are used to seal rotating machine components. The radial-rotary-shaft-seals are standardized according to DIN3760. The sealing lip of the radial-shaft-seal is being pushed onto the shaft by a hose spring. The construction form AS has an aditional dust lip to prevent the ingress of dirt. 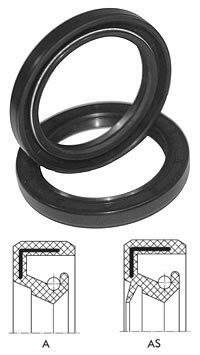 Radial-rotary-shaft-seals are colloquial known as Simmerringe. The product name Simmerring is a registered trademark of the Freudenberg Sealing Technologies. 10% discount if you order 25 pieces! 20% discount if you order 100 pieces!